Hello crafty friends! I know that it has been a long time since I posted to my blog – too long perhaps but I’ve emerged this weekend to create a Snow Day! I know that as adults we always wish we could get a snow day but it seems to be very rare. In our part of the Rockies, we are a little dry for this time of year but it’s been windy as all get out lately. And, while I have not posted on my blog since late summer, I have not been lacking in visits to my craft room. I decided to get caught up on some scrapbooking projects, reorganize and outfit my crafting space, and treat myself to some scrapbooking retreats and art classes. Of course, I still have a busy work schedule but we also found some time for a couple of vacations (England and Portugal), I ran two marathons (Chicago and Disney), and the front yard landscaping project is inches away from being finished! But late this week I decided it was time to play with my mixed media stuff again. So, I’m joining in on the Frilly & Funkie Winter Blues Challenge. The challenge is graciously sponsored by Linda at the Funkie Junkie Boutique. The challenge wants us to focus on the “winter blues” we get – the post-holiday, pre-spring slump that I refer to as “February.” While February might be the shortest month of the year by days, it is simply the longest one for me. I’m past the January post-holiday cleanup and organize and not quite to the longer days and get-my-garden-ready March. So for the challenge, I decided I wanted to stay in winter and focus on the color blue. I had a couple of ideas but finally ended up with a snow day. I started off with a piece of Distress Woodgrain Cardstock and cut it down to 5x7 and used Distress Paint (Tumbled Glass) to color the cardstock. 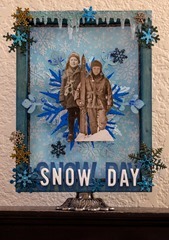 When it dried, I grabbed my Newton’s Nook Snowfall Stencil and Ranger Opaque Matte Texture Paste to create the snowflake background. I used a very thin layer of texture paste so that some flakes seemed thicker than others. While the texture paste was drying, I worked on the large snowflake. In my chipboard and wooden pieces, I found a wooden snowflake from Art Minds. I covered it in Finnabair Art Basics Heavy Gesso (white) and then painted it with Finnabair Art Alchemy Acrylic Paint (Sparks – Magical Pond). When the paint dried, I added some Ranger Foil Sheets (blue) to add some bits here and there for texture and to add a touch of a darker blue. The second snowflake uses the Sizzix Tim Holtz Layered Snowflake. I used the Sizzix Foil Adhesive Sheets (there is an ice blue color in the pack) and attached it to some manila cardstock. Once I die cut the snowflake, I embossed it, and then took some Adirondack Alcohol Ink Mixative (Silver) and used a q-tip to color the embossed lines of the snowflake. The top snowflake is die cut using the Sizzix Tim Holtz Ice Flake. Using Versa Mark and Ranger Embossing Powder (Blue Tinsel), I made the snowflake a brighter blue. Now that I had the snowflakes and the background, it came to putting it all together. I went digging through my frames, canvases, and other bits and pieces and found a Prima Wooden Frame. I thought about painting the frame but instead went for a “stained” look and inked the frame using Distress Ink (Faded Jeans). The inside of the wooden frame was a bit over 5x7 so I trimmed the snowflake piece a smidge and used Tonic Studios Speciality Paper (Crushed Metal) as a layered background. It’s barely visible but gives some depth on the sides. I grabbed every type of metal snowflake I have in my bits and bobs. I found some from Finnabair (Mechanicals – Winter Trinkets), Tim Holtz Idea-ology (Snowflakes), and various charms and metal pieces I’ve picked up from The Funkie Junkie Boutique. I also found some snowflake brads. For some of the snowflakes I alcohol inked my fingers and the snowflakes in Adirondack Alcohol Ink (Sailboat Blue). I decided not to do all of the snowflakes in blue and because there was also some leftover glitter on my craft mat some of them got a bit of glitter added to them too! I added the Tim Holtz Ideology Icicles to the top of the frame after I covered them in Nuvo Pure Sheen Glitter (Glitter Diamond). I found that this glitter worked better than the Stickles Dry Glitter. As I was glittering the icicles I didn’t try to make it perfect because icicles never are! For the title I used the new Sixxiz Tim Holtz XL die cut alphabet (Society) in Core’dinations Distress Cardstock (Faded Jeans). I also used the Tim Holtz Ideology letters (Typography) in white so there is a quasi-layered effect between the die cut letters and the smaller letters. I decided to keep the smaller letters white for a little bit of a contrast. I assembled all of the snowflakes and glued the piece to the Tim Holtz Idea-ology Vignette base. As those were setting, I grabbed the two Tim Holtz Ideology ancestors and added a touch of Distress Ink (Faded Jeans) to the hat and jacket collar of the boys. Two young boys hoping for a snow day! I think that’s all of the work and all of the items used for this project. While we slowly plug our way through February, maybe there might be a snow day coming soon! I hope everyone has a lovely Valentine’s Day and thank you for stopping by to see my project. Stay warm and enjoy a cup of hot cocoa. I'm so happy you have decided to blog again after your busy break! Wow! You did more in 6 months than I've done in a lifetime! 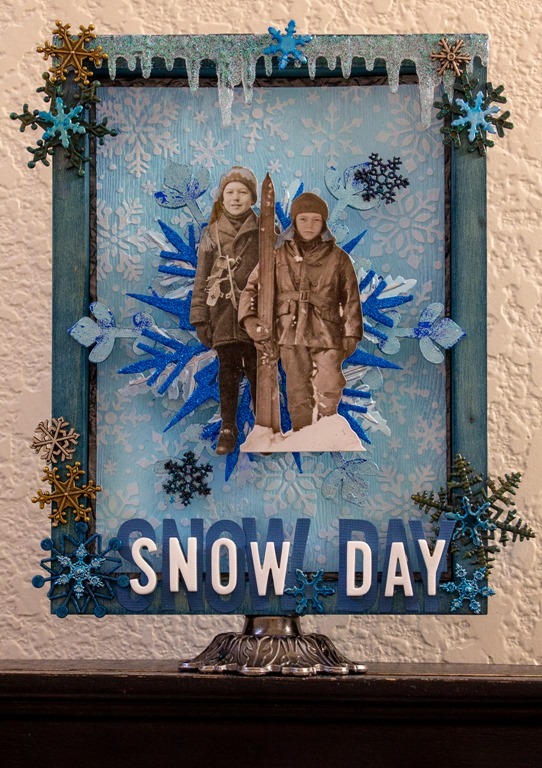 Love your SNOW DAY vignette! Those icy cold snowflakes look so pretty against your snowy background, Makes me wish for cold weather again! I'm so pleased you joined us for our Winter Blues challenge at Frilly and Funkie! Hugs! Great to see you back. It sounds like you have been super busy lately. Love your Snow Day and if you were here you would be looking outside and saying it is a replica of what you see. Schools were closed the other day and they showed kids doing just what these kids show - skating, skiing, sledding. Love the big snowflake and the icicles. BTW, I wouldn't be wishing for cold weather of I were you and if you want some, I would be happy to try and send it your way. There is anywhere from 2 feet to 8 feet of snow in piles where it has been shoveled and last week it went from -38F to +42F in less than 48 hours and then dropped like a stone.